My research interest is in therapeutic targeting – using nanotechnology to make existing and new medicines work better and with fewer side effects and toxicity. Essentially, I’m interested in designing and manufacturing carriers or “vehicles” that I can load these medicines into, and then modify the vehicles to act like a GPS to direct the cargo to the site of disease. This allows the development of safer and more effective medications and diagnostic tools. I started my working career as a clinical pharmacist, where I saw so many of my patients experiencing awful side effects from medicines that were actually helping to treat or manage their condition, such as patients with cancer or chronic pain. I believed that there had to be a way we could improve these therapies. That’s when I realised that if I wanted to help make a change, I needed to become involved in research. To improve the way we treat patients through designing medicines and diagnostics that are better at specifically targeting the site of disease – in this way we are able to increase their effectiveness and significantly reduce the risk of side effects and toxicity. The goal would be to develop new therapies that act like a “magic bullet” for specific diseases or sites in the body. Associate Professor Susan Hua is a registered clinical pharmacist, academic and researcher at the University of Newcastle and HMRI. As a hospital pharmacist, Associate Professor Hua has seen first-hand how many of her patients experience serious side effects from medications that are actually helping to treat or manage their condition. This includes patients with cancer, chronic pain, burns, infections, and rheumatological conditions. Current medications mostly distribute drugs to both target and non-target tissues and cells, which means they can also damage healthy cells and/or severely affect the quality of life of patients. This spurred her to pursue a PhD in the field of neuroscience and nanotechnology at the University of Queensland. Associate Professor Hua has become a leader in the field of therapeutic targeting and translational nanopharmaceutics. She has independently established the first translational nanopharmaceutics laboratory and research program in the Hunter, and has built strong collaborations with other major research groups locally and around the world. Her research expertise covers the areas of advanced pharmaceutical formulation, in vitro cellular studies and preclinical in vivo animal studies. This expertise provides a solid foundation to formulate and evaluate new systems to deliver drugs to the body and apply them to specific diseases. Associate Professor Hua is particularly interested in using nanotechnology to study novel mechanistic pathways, as well as to develop more efficient therapeutic delivery systems. This essentially means developing more effective and safer medications and diagnostic agents through loading bioactive compounds and imaging agents into “vehicles or carriers”, which are then modified to allow specific targeting to the site of disease. This technology is important to allow compounds to bypass biological barriers that would otherwise degrade or hinder their accumulation at the target site. This allows maximum targeting efficacy with lower doses and frequency of doses, as well as reduced side effects and toxicity. A number of her key projects are focused on translational pain research in the areas of peripheral analgesia and inflammation, an area in which she has established important laboratory models of acute and chronic pain at the University of Newcastle. Associate Professor Hua has generated in excess of $1.4 million in research funding over the past 5 years. Highlights include successful NHMRC funding, a GAPPS international grant, the Pharmacy Research Trust of NSW grant, and funding from the Rebecca L. Cooper Medical Research Foundation. The majority of Associate Professor Hua’s projects are translational and are currently under IP commercial in confidence stages. These projects have all applied the use of nanotechnology across a number of research disciplines. Among her outcomes are a targeted drug delivery system for delivering therapeutics specifically to the uterus (collaboration with HMRI Mothers and Babies Research Centre), along with new delivery models for drugs that target inflammatory cells in the gut (collaboration with AGIRA), and novel treatments for pain. Associate Professor Hua has established a productive publication track record, having first or senior authorship positions on over 80% of her publications. Her research has also led to invitations to speak at various conferences/symposiums both locally and internationally. She is an editor for Frontiers in Science – Neuropharmacology, a member of the NHMRC Research Translation Faculty, and an active external reviewer for grants and publications in the field of pain, pharmaceutics, and inflammation. 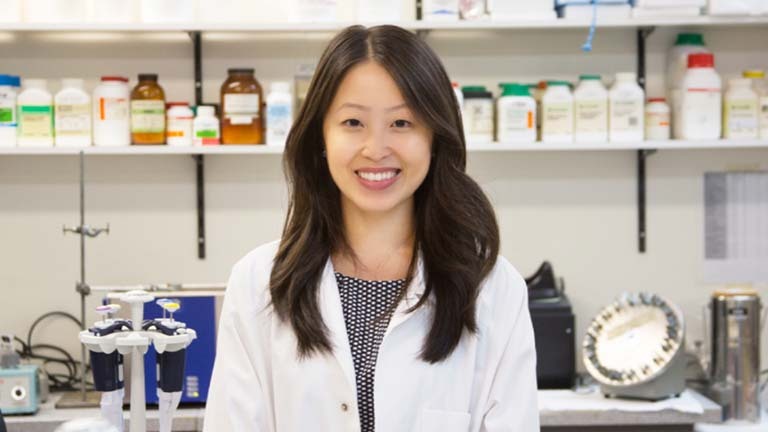 In 2015, Associate Professor Hua was awarded the HMRI Award for Early Career Research, highlighting her significant and valued contribution to the research community.